This is an article I had written several years ago. Seeing as there are still many links to the article and it still receives many visitors I have decided to save it in this new location on my personal site. This article is aimed at users of Autodesk/Discreet’s 3ds max who are transitioning to Softimage XSI and covers the fundamentals. When time allows there will be follow-up articles published which will take a closer and more in-depth look at the various aspects of Softimage XSI such as the Net View, Synoptic Editor, Scripting, and lots more. You can find Softimage tutorials by Stefan Andersson on the excellent website of Ed Harris. This article is written primarily for Discreet 3ds max users that are making the transition to Softimage XSI and are struggling with the fundamentals and the different ways to control and operate the program and those that want to know the major areas of difference and overlap and how they relate to current individual experience levels. This article does not cover all the functionality in Softimage XSI and does not focus on specific features but is written as a more general, and hopefully helpful, summation of differences and similarities between Softimage XSI and 3ds max to help users that are at the start of their transitional learning curve. Softimage XSI offers a quicker and more responsive interaction. Fully integrated support for Mental Ray. Large and complex scene management capabilities and features. Designed for individual artists as well as team oriented groups. Consistent design and layout without clutter. Strong animation and IK capabilities and extremely fast skinning. A strong and responsive company with a tight and helpful user community. A common comment made by users making the transition is that the Softimage user interface (UI) and workflow are fundamentally different from 3ds max and present a fairly high learning curve. While each individual user will learn at his/her own pace it seems that most of these fundamental differences are very minor in nature and generally require basic knowledge of Softimage XSIs interaction methods (i.e. the manual control and handling of they keyboard and mouse). It is in this area where most of the differences are encountered that are often experienced as confusing by new users. One of the important differences between 3ds max and Softimage XSI is that the shortcut keys on the keyboard can often operate in two different modes, referred to as supra mode and sticky mode. Supra mode requires you to keep a key pressed while interacting with the objects and components in your scene using a specific feature (such as move vertices). Upon releasing the key the mode defaults back to its previous state. This allows for very smooth and fast interaction once you are more familiar with it. Sticky mode requires you to tap the key (i.e. press and release) and will switch the mode of operations until you manually select a different operation. Instead of having to alternate between different selection modes (i.e. vertices, edges, faces, etc.) using methods that require two or more manual actions the keyboard handling in Softimage XSI allows for very rapid interaction with elements in your scene. Transformations can be constrained to an axis using the left, middle or right mouse buttons, which will execute the interactive transformation. Instead of having to pick and drag an axis on the transform gizmo the three buttons will each allow for individual axis constraints. Softimage XSI relies heavily on three button mouse functionality. Many programs out there support either the action-select or select-action model for interaction. These terms refer to the way you operate the program by either picking the action or command followed by the element (action-select), or by picking the element first and then pick the action or command (select-action, as in 3ds max). Softimage XSI freely supports both interaction models. One of the aspects of Softimage XSI that many transitioning users find confusing is the layout of the UI itself. Theres no sense arguing style, taste, and individual preferences but after a short initial period of exposure and use of Softimage XSI you will probably find that the layout, and in particular the organization of commands and operations are very well defined and do not require much effort to locate. All the most commonly used controls are part of the main UI at all times and learning how to effectively make the best use of these can become a key experience factor that will allow you to use the UI for which it clearly has been designed; speed. The axis selection controls and their associated text boxes are a good area to focus on initially. 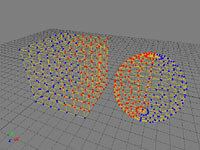 While these appear to represent similar functionality to the 3ds max transform type-in controls they go much further and offer functionality that will allow exact transformations or tweaks without having the brain pre-compute the numeric representation. Various keys on the keyboard will allow for quickly increasing or decreasing the values in input boxes in steps ranging from 0.1, 1.0, and 10.0. These input boxes support relative and absolute values as well as math operations. One thing that becomes obvious when transitioning to Softimage XSI is that the entire system is designed to handle the speed at which creative freedom of the mind needs to be translated into operations and actions in 3D space. After having used 3ds max for many years since its early development stages and being more than simply proficient at its controls I can safely say that in terms of interaction speed and control over the program it excels in nearly every area. 3ds max users making the transition to Softimage XSI should focus on; the hotkeys and their usage paradigm, the selection methods, and the basic minor details on the different ways to interact with objects and components in the scene. These basics are likely to grow on you very quickly. While the different interaction methods may appear more complex due to the nature of having a wider choice the end result will inevitably allow you quicker and more control over your actions. In 3ds max you will be familiar with the modifier stack and how you can use it to access the different modifications made to a scene element. In Softimage XSI the modeling history and the various properties and parameters that apply to various stages of your process are listed in tabbed property windows that allow direct access to all the properties of your objects, nodes, and components. Instead of selecting a modifier and its properties in 3ds max from the list view you can use the property tabs in the windows in Softimage XSI which operate on the same principle. Parameters that are common between different objects can be displayed and modified in a single property window. The floating property windows provide access to parameters in a way similar to the command panels in 3ds max. For those who prefer to have parameter information and controls available on-screen at all times it would be advisable to dock the Softimage XSI property editor into a viewport. 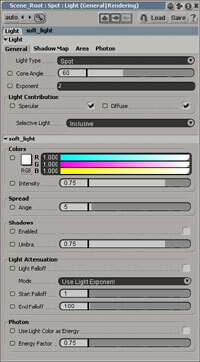 In addition to providing the property pages a more detailed set of controls is available to you which allow the saving and loading of parameter sets, connecting parameters (for instance connecting a diffuse color to a shader or texture), all from the property pages that offer the whole range of functionality without having to go through or to different parts of the program. While conceptually equivalent to the modifier stack in 3ds max there are a number of things to adjust to. First of all, the operator stack will store the modeling and transformation operations that you execute. This means that a translation operation will be stored in the operator stack if you move a vertex of a mesh object. Needless to say, after a lot of manual tweaking you will end up with quite a substantial (and in most cases undesired) operator stack. Softimage XSI Operator StackThe benefit of having all these operations stored in the operator stack is that you can effectively disable the stack (and its results) from any given operation that has been stored, modify an operation or delete one or more specific operations, move operations to adjust their order and sequence in the stack, or freeze the operator stack up to a selected operator. Please note that freezing in this context can be regarded as the equivalent to collapsing the 3ds max modifier stack (or parts thereof). The operators in the stack in Softimage XSI even go a bit deeper than what you are accustomed to in 3ds max because you can modify the parameters of an operation in the stack on the fly (such as translation of vertices, etc.) If you are expecting to do one or many subsequent operations that you do not want stored in the operator stack you should turn on immediate mode. This will prevent the operator stack from recording your actions. The order of the operations in the operator stack, are as important as the order of any modifiers in the modifier stack are. If you make changes to, for example, the topology of an object it will affect the flow in the operator stack and all operations that follow. This means that if you change the subdivisions on an object by modifying its creation properties, any operations higher up in the operator stack that may depend on component selections might cause undesired results. You may want to consider applying subdivisions higher up in the stack, seeing as how the flow would not affect any previous operators. Using the explorer you can change the order of operations in the stack (by dragging the operations around). Teamwork is clearly a strong focus in Softimage XSI. Sharing custom layouts, scripts, and addons is provided through a packaging system that allows the system to gather the required files and data and ready it for distribution amongst the team. Creating worksgroups so all users are sharing the same scripts and addons is effectively simple and only requires the user to set the workgroup path through the preferences dialog. A word of advice would be to not be afraid to feel like a beginner or to think like one. The interaction basics of the controls may seem trivial and unimportant but do, in fact, form a key aspect of what frustrates transitioning users. These basics are fundamental to Softimage XSI and understanding them, combined with a little experience, will allow you to gain quicker control over your actions. Remember how to use sticky vs. supra mode and use them appropriately to gain quicker control over your components. While not absolutely required, do remind yourself that the keyboard is your friend. Keyboards are good, but dont overdo it by building a temple of worship for your favorite keyboard. Focus on using keyboard shortcuts instead of on-screen controls. Use hotkeys as much as possible while using the on-screen controls as the primary reference. Keep in mind that buttons often have context menus associated with them which can used to access more detailed functionality. Dock a property window in a viewport if you are doing a lot of work that requires frequent tweaking of parameters. Get familiar with using the recycle and locking icons on property windows to get your property pages to display in the same window or same docked location. With a little experience in using these features it will get you up to speed in ways that you are familiar with in 3ds max. While there are many fundamental differences the operator stack in Softimage XSI can be regarded as the equivalent of the modifier stack in 3ds max. Keep in mind that the operator stack in Softimage XSI stores more operations and actions than the modifier stack in 3ds max, allowing for wider control but at the same time being potentially confusing to transitioning users. Using ALT and the right mouse button will bring up context menus. Depending on whether you are interacting using the action-select or select-action methods you may want to pay attention to the bottom status bar which provides feedback on what the expected order of subsequent actions needs to be. Remember, in Softimage XSI, the Y-axis is up, as it should be! In 3ds max you will be familiar with the falloff and shadow cones for spotlights and you may feel surprised not to see them in Softimage XSI. Select your spotlight icon (just the light itself) and press the [B] key to access the objects manipulators. You will now be able to adjust the shadow and falloff cone interactively while having visual feedback. Using the [B] key to access manipulators you can also scale your camera, spotlight, etc. icons if needed. An important aspect is to understand the difference between the Softimage XSI and Softimage 3D selection methods. Softimage XSI supports the legacy selection methods for those who have prior experience with Softimage 3D. When making a transition from 3ds max you may not feel comfortable with the Softimage 3D selection method (which uses the different mouse buttons for tag, untag, and toggle selection) and you would want to make sure that you are using the Softimage XSI selection method (which uses CTRL and SHIFT combinations for selection, additive selection, deselect and toggling). Check the select context menu on your right hand side to determine the selection method you are using. A major difference between 3ds max and Softimage XSI lies in the way the latter handles scene components (i.e. vertices, polygons, edges, knots, etc. ), selection of elements and objects, and access to the different component selection modes. 3ds max uses an operational paradigm that requires an object, a mode, and an operation/function to be selected prior to making modifications. The Softimage XSI paradigm operates similarly but with a number of distinctions. One of those distinctions is that you can select multiple objects and operate simultaneously on their components such as faces, edges, and vertices whereas in 3ds max you would have to leave the selected mode and object prior to selecting another object to work on. This difference lies mostly within the architectural design of the two different programs. 3ds max will manage a modifier stack per object which prevents you from selecting and moving the vertices on two individual objects. The modeling history in Softimage XSI is designed to allow access to an objects elements regardless of the underlying history of operations that define the object. Because of this design difference, Softimage XSI allows you to switch between object elements on the fly with a single key press while maintaining highly responsive interaction and visual feedback. A cluster is a named selection set consisting of components of a single type. You can cluster vertices, edges, etc. by name and access them directly from the clusters selection button. In 3ds max you can set and select named selection sets of, for example, vertices on a mesh while in vertex selection mode. In Softimage XSI the clusters are available regardless of the selection level of the object that is currently active. 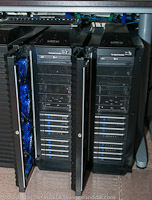 This minor difference allows for quickly switching between clusters. Clusters in Softimage XSI go beyond the functionality of named selection sets in 3ds max, though. 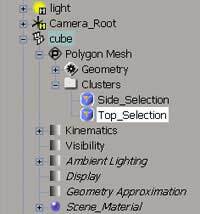 For example, in Softimage XSI you can select multiple objects, select vertices (or polygons, or edges, etc.) on these different objects and create a cluster. When you select one of those objects and select the cluster you just created it will only select those elements on the selected object. You can, however, also select single or multiple clusters on multiple objects simultaneously and work on those components directly. Using the cluster selection method you can interactively pick an entire cluster by selecting a component contained in it. Clusters can also be automatically created with a null (the equivalent of a dummy helper) object at the center (equivalent to a pivot in 3ds max). This is the equivalent of using a linked xform modifier in 3ds max, except that Softimage XSI will automate the setup process for you. In 3ds max you will often select objects by their name using the select-by-name dialog. The equivalent of this can be found in the form of the explorer in Softimage XSI. The explorer does not only list objects and groups but is able to display detailed tree-based information about your scene, project, objects, etc. including the parameters of different elements. The explorer is similar to the familiar tree view controls in Windows based applications. Another efficient way to select one or more objects is to use the object selection input box on your right hand side. You can select objects by entering the name, including wildcards. This simple feature is often overlooked by 3ds max users and offers more than just an object selection mechanism since it also supports the selection of properties or elements such as edges and vertices (on single or multiple objects). When you are just starting out make sure to spend some time learning the various selection methods. These form an extremely important aspect to your quicker understanding of Softimage XSI. Conduct some experimentation with the raycast style selection methods for edges and polygons. Think of clusters in Softimage XSI when you need to use named selection sets. If you frequently rely on named selection sets in 3ds max you will discover that clusters can save you a lot of time in Softimage XSI. Provide clusters with a custom color to keep a visual track of them. Softimage XSI can not animate components or clusters directly. Use the null object for this (or use shape animation). While in 3ds max there is the concept of a multi-material and surface/face ID you can use clusters in Softimage XSI to apply a material to a selected part of you object. You can also group clusters together in order to have them share the same shader. Assigning materials to clusters is as simple as dragging the material nodes to the root of the cluster or cluster group in the explorer view. Null objects (represented by an axis) and Implicit Geometry (non-renderable) shapes and primitives in Softimage XSI can serve the same purpose as the dummy helper objects in 3ds max. Likewise, scene components that are known as helper objects (including lattices and space warps) in 3ds max can be found in Softimage XSI where such objects are called control objects. You can also use Implicit Geometry objects to create simple or elaborate manipulators by linking their control parameters to any other parameters of the object they are meant to manipulate and change. In 3ds max you would use the object linking controls to create parent-child relationships between objects in order to construct your hierarchy. 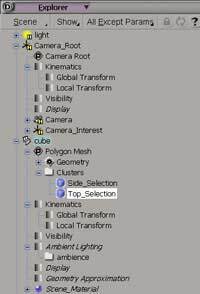 In Softimage XSI you can simply drag and drop objects onto each other in the explorer to construct your hierarchy. Alternatively you could use the parent constraint button, which depending on your sequence of selection and mouse buttons allows the construction of child-parent and parent-child relations. To unlink a relationship you can use the constraint cut button (or hotkey). Softimage XSI has a number of equivalent features for handling xref objects and scenes, namely external, exported, and referenced models. This is an area where it becomes evident how well suited Softimage XSI is for handling large and complex scenes that are designed by individual artists or teams. External models are stored in separate files and only those that are actually modified in a scene will be re-saved, resulting in excellent optimization of time spent doing basic file input and output. Exported models are those that are exported from a scene for use in other scenes and as such will not contain any external dependencies such as modeling relations, expressions, and constraints. Referenced models are similar to exported models with the exception that they are referenced from their original scene (causing changes to the model to be reflected in the scenes that depend on the model). In 3ds max any xref object you import into your scene can have its properties and parameters overridden without affecting the source of the xref object. While this is a straightforward way of modifying the object, its animation, and its materials, there tends to be a lot of potential for confusion when adjustments are hard to track or remember. In Softimage XSI you would want to use property overrides to modify the local properties of an imported model. You can collect all the different properties of a model, including textures, materials, shaders, etc. and store these as a single property override which allows you to immediately re-apply a whole range of parameters and properties when changes require the re-import of an updated (or completely new but similarly constructed) model. When you are working on complex and dense scenes try to make good use of the layer facilities to control which groups of objects are displayed, rendered, etc. In Softimage XSI 3.0 the powerful combination of LOD (level of detail) and reference models are available by way of setting high, middle, and low resolution reference models directly. In 3ds max you would use a separate LOD pass either in the reference model directly or at the level of the scene which uses an XRef model which normally causes more scene management clutter. Softimage XSI uses a concept called modeling relations when constructing objects from different parts. If, in 3ds max, you want to extrude a shape along a path by lofting, the resulting object will carry with it the parts it was derived from. Depending on your modeling needs you may find yourself extracting these parts back out of the loft object again and/or requires you to go into one of the sub-object modes. The modeling relations in Softimage XSI act similarly, are more straightforward; the new object will depend on the parts you used to create them. You can directly edit and modify any parts that were used to create a new object but with the modeling relation stored in the operator stack it would break the new object based on the relations if you delete any of the parts used to derive the new object. This behavior is different from 3ds max which, in most cases, will keep a copy of the parts at the sub-object level. In Softimage XSI you will have to devise your own way that is most comfortable for you to keep parts and objects together if you want to sustain the modeling relations. A simple suggestion would be to group the objects together. The above may seem more tedious and less automatic but actually allows you more and quicker control at the expense of an additive manual action. Because the objects used to derive the new object remain real world objects, as opposed to sub-objects in 3ds max, all the various selection mechanisms will apply and behave as expected, saving you from the need to hunt through sub-object levels. You can still substitute the parts of a derived object based on a modeling relation with a different part, similarly to how 3ds max in some situations allows you select and replace a sub-object that an object depends on. In Softimage XSI this is called substituting the input. The soft selection features of 3ds max can be found in Softimage XSI as proportional modeling. The Prop button in the transform controls panel allows you to turn this on and off and offers access to the settings and options by right clicking the button. You will find that these controls work similarly to 3ds max. If you are more familiar with the keyboard you can change the distance limit by keeping the [R] key pressed and click-dragging the mouse around. In addition to that you can also apply incremental changes by using the arrow keys. Often, in 3ds max, you would encounter situations in which you had to duplicate a modifier in the stack while deactivating the original one. In Softimage XSI you would want to examine the property override feature which covers the same functionality (while additionally enabling you to override specific selections of properties, even those of materials, on multiple objects). If you have made changes to (i.e. transformed) the center of an object (the equivalent of a pivot in 3ds max) you might want to freeze the operator stack of an object. In cases where you need the actual center of the geometry of an object use the COG (center of geometry) mode, located under the transformation controls. Collapsing the operator stack, or selective operations, is referred to as freezing in Softimage XSI. Note that freezing an object will also automatically bake any texture projections onto the objects geometry. When comparing the Softimage XSI operator stack with the 3ds max modifier stack the common result is that you will miss some of the functionality of the modifier stack but will learn how to wield and control the finer precision that the operator stack offers. An effective way of keeping derived objects and their parts, which are part of a modeling relation, together is to group them. When using proportional modeling you may want to consider leaving the options window floating around to make quick adjustments to the proportion and surface options and parameters. Curves can not be made into closed shapes by clicking on the first knot, instead use the curve open/close command. Also, create curves in a counter clockwise fashion to ensure correct normals when using the curves as a basis for creating surfaces. As a 3ds max user you may have come to expect a certain tangency of curves for which you would often normalize. In Softimage XSI you can accomplish a similar reconstruction of a curve by using the Fit on Curve creation tool. Curve creation tools in Softimage XSI are not as extensive as the spline editing facilities in 3ds max and will often require you to use different modeling methods to get the same result. One of the important things to keep in mind is that you can select multiple curves and shapes and turn them into a mesh, at which point you can use the powerful polygon tools. A modeling relation between your curves and the mesh will then also exist. This constitutes the preferred way of dealing with, what is referred to as, shapes in 3ds max where you would create shapes from multiple splines as a basis for your model. If you are using proportional transformations (the equivalent to soft selection in 3ds max) you can go to any operation in the stack, such as vertices you have moved, and alter the proportional transformation properties. The animation capabilities of Softimage XSI alone would warrant many chapters of written information regarding the differences that you would encounter during a transition period between products. Instead of writing that entire chapter this section will only highlight the basics and fundamentals that may be of importance in the early transition stages. 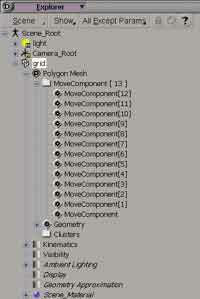 Animatable parameters in Softimage XSI are represented by a small green icon that looks like a checkbox. When you had to determine which parameters are animatable in 3ds max it would be common to check the track view which would list only those parameters. Softimage XSI offers you a consistent overview while exposing functionality relating to animatable parameters through these small green icons, which incidentally, are called animation icons. Anything with such an animation icon can be animated or linked to other parameters, scripted operators, or expressions and will identify the type of animation associated with the parameter by changing the representation of the animation icon. The approach taken in Softimage XSI clearly shows the product has been designed with animation foremost in mind. Instead of using the trackview approach in 3ds max to animate specific parameters the control over which parameters you animate in Softimage XSI is provided through all property pages and the animation controls panel on the bottom of the UI which offers a menu to set keyframes on specific parameters as well as user defined groups of parameters that are specifically marked to be animated. Marking parameters is done by selecting the textual portion of a parameter in a property page. You can be chose to be responsible for determining which parameters should be animated by marking the parameters first. While this may, at first, seem tedious compared to automatic keyframing you will find that having absolute control over these animation switches throughout all aspects of the UI (from property pages, the explorer views, etc.) is more a blessing than a curse, especially considering the many times we have all animated a parameter or two in 3ds max that we didnt want to only to find ourselves deleting the keyframes as a result. If you have used custom attributes in 3ds max you will be pleasantly engulfed with custom parameters in Softimage XSI where such user defined custom parameters are an integral and fundamental part of the architecture of the product itself. While often used in animation, custom parameters are not exclusive to just animation but are nonetheless located under the Animate-Create-Parameter menu. 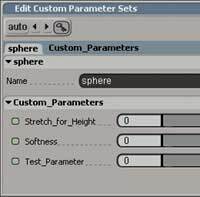 Any animatable parameter in Softimage XSI can be linked to custom parameters and detailed expressions or scripts that can be created and managed through the integrated expression editor. In 3ds max it is common to create custom attributes to create a more simple control interface to the parameters of an object or parts thereof. In these cases the custom attributes would only be used to drive the target wired parameters. For these situations it would be advisable to use proxy parameters in Softimage XSI, instead of custom parameters. Proxy parameters reflect the direct value instead of holding its own information and are by definition a clone of the original parameter. While 3ds max introduced the concept of parameter wiring since version 4.0, the concept of linking parameters in Softimage XSI is more fundamental and thereby also more profound. 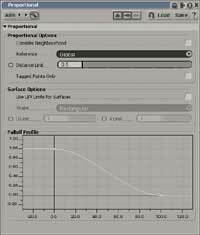 If you have used parameter wiring in 3ds max and liked it you will love it in Softimage XSI. There are, however, a number of things that, especially at first, can seem confusing in how to properly setup linked parameters. A few things to help you visualize the links and relationships are provided by turning on relationships in the viewports or by using the schematic view. With 3ds max it is often second nature to rely on information that is stored in the scene and objects whereby similar information is shared either by instance or reference on many different objects. When you are enveloping your character in Softimage XSI you would often need similar functionality so heres something to keep in mind; select all the objects that you are using as deformers and make a group for them. When you have selected your mesh (middle click to branch select) and applied the envelope you can select the entire enveloped mesh and get the weight editor up [CTRL-E]. From the weight editor you can save your envelope as a preset. Anything you have to detach any of the deformers you will have the envelope data saved and ready. In 3ds max you are accustomed to using the big red animate button to enable the animation mode that will animate any changes you make. To get up to speed with this basic way of animating you can use the autokey button in Softimage XSI. For simple keyframing, the [K] key will create a keyframe using the currently selected tool or mode. Keep in mind that Softimage XSI is heavily based on the drag-and-drop paradigm even if in many cases it does not appear as such. Basic linking of parameters and the creation of custom parameters really is as simple as dragging and dropping. Create marking sets of marked parameters to group parameters that you frequently wish to animate concurrently when setting keyframes. There is, however, a limitation of one set per object unless you create a few lines of script code to switch between named sets. Softimage XSI offers a number of different options from the menus copy animation and parameters but if youve grown used to copying entire tracks in the 3ds max track view, then the easiest way to accomplish similar copying in Softimage XSI is to drag and drop the parameters from one object to another using the explorer view. Remember to right-click on animation icons to access associated functions. Once you get into extensive use of custom parameters and find your layout and style of parameters to be disorganized, consider creating an SPDL file so you can gain full control over the custom parameters. SPDL files allow you design control over custom parameter panels. While built on uneventful, uninteresting, and vanilla technology the Synoptic View manages to combine vanilla components, such as the web browser (or a built in equivalent under Linux), into a very well integrated custom selection system. The Synoptic View allows you to quickly create a web page using images and hotspots (which can be designed and set through the Synoptic View editor itself and require little to no manual HTML effort) that are linked to scripts or script commands used by Softimage XSI. These pages allow you to create custom control and custom selection interfaces that go beyond the flavorless selection dialogs. TDs can setup the Synoptic View pages for models in the scene and thereby provide an easy selection and control system for artists who might otherwise be working their way through selection sets, named objects, clusters, or poses. While the Synoptic View might not have much to offer for the single freelancer or individual it offers a very effective system for teamwork. The common approach in 3ds max is to keep notes and scripts around, along with different selection sets or layers (3ds max 5.0) that allow artists to access different components but lack in visual representation that the Synoptic View offers in a more direct and accessible way. Because the Synoptic View allows scripts to be executed through links in (what basically is) a web page the functionality can extend beyond that of a selection system. In respect to the synoptic view, it is basically a component similar to the Net View that has been adapted for quicker use, but more on that later. The plethora of parameters and options for selected elements, or the entire scene, can be accessed through the built-in spreadsheet editor. This is an area that required 3rd party plugins or scripts for 3ds max and often presented limited functionality so it should be a relief to find a fully functional and integrated spreadsheet in Softimage XSI. 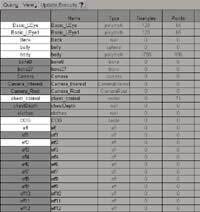 Through the built-in spreadsheet you will be able to select objects and elements and modify their many parameters and options such as whether elements are selectable, their display method, visibility levels, grouping, image sources, shaders and materials, lights, transformations, you name it. Managing large and complex scenes with many elements will certainly benefit from using the spreadsheet. As an added benefit you can add textual annotations, keywords, and flags to objects which can be used in spreadsheet queries. If you are part of a team and often need to exchange and share material then it is advisable to learn about the details of the Synoptic View as a means to provide textual and graphic references and notes for your fellow colleagues. It doesnt hurt to investigate the deeper functionality it has to offer. The Synoptic View may look like a silly novelty at first but it is far from a simple novelty feature. Become intimate with the spreadsheet if you are creating and managing large scenes. Remember you can load and save specific spreadsheet queries to make life easy when working with selected sets of information. Get a firm understanding of how properties are propagated in object hierarchies and trees. Use the schematic view often and frequently. One of the advantages of the scripting capabilities is that it supports any ActiveX compliant language such as VBScript, PerlScript, Python (using the ActiveX version) and JScript and as such supports industry standard languages without requiring you to learn a proprietary language. Typing script commands to control Softimage XSI works similarly to using the MAXScript listener in 3ds max. By default Softimage XSI logs all operations in the script editor, similarly to what the MAXScript macro recorder does in 3ds max. If you are in immediate mode, property changes are not logged. thanks for the tips, they were indeed helpful. i however still couldn’t find how to select the subobject “element” and detach it.